For more than forty years, Fitzpatrick, a mid-size New York based law firm, has been unrivaled in the complex world of intellectual property. In recent years the firm has experienced a diminished profile due to the exits of key clients and intense competition from general practice firms. NEO was engaged to help reposition Fitzpatrick as a premier intellectual property law firm that excels at leveraging their expertise to help clients in all areas of IP law. NEO conducted extensive brand research which revealed underlying themes about the firm, their culture, and the way they service their clients. This culminated in the creation of new brand positioning including a set of core values that informed every piece of marketing communications created by Fitzpatrick. The Fitzpatrick logomark sets the tone for the brand’s overall identity. Its modern-yet-classic lettering and distinctive, highlighted “ip” letters and accompanying tagline lock-up reflect Fitzpatrick’s position as a premier intellectual property firm. IP-focused content, a dynamic new user interface, and a modern image that represents who the firm is now. A key feature is the robust attorney search which allows user to filter information based on a number of categories: service, industry, technical expertise, title, school and office. A responsive interface ensures a consistent user experience on all devices from desktops to smartphones. 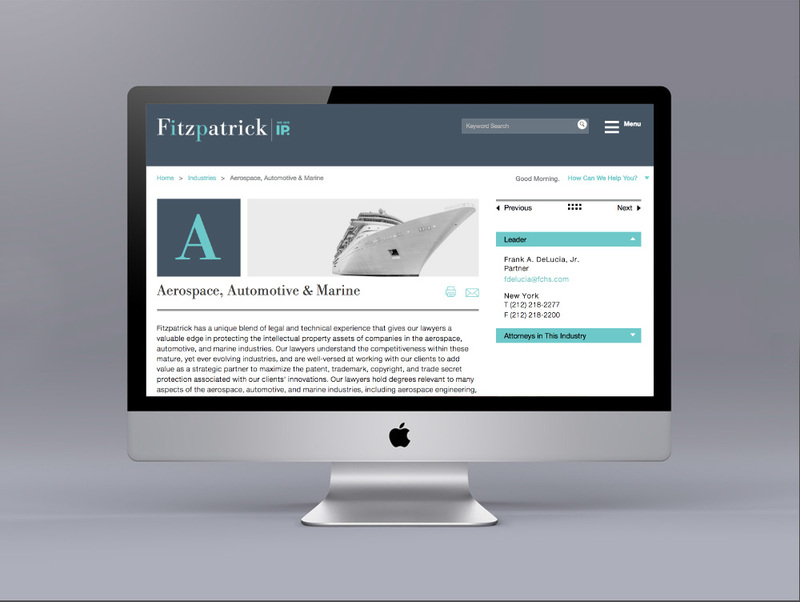 A style guide ensures that Fitzpatrick’s new brand is articulated across all media, helping tell their story in a way that is credible and compelling. Consistent use of these brand guidelines reinforces Fitzpatrick’s position as a world-class, IP-focused firm. Guidelines are included for implementing the company’s corporate identity in websites, printed collateral materials, advertising and trade shows.